The QWERTY style keyboard used today can be traced back to 1873, according to a recent blog post at UltimateTyping.com, the website sponsored by eReflect, developer of the well-reviewed software Ultimate Typing 2013. The post highlights that despite technological advancements, typists continue to use the QWERTY style keyboard even though it was actually originally designed with the intent of slowing the user's typing speed. As the blog post points out, such a keyboard style may not be ideal for helping typists to type at maximum speed. Recent technological advancements and innovations in this area reflect attempts being made to introduce new keyboard layouts and additional features that will allow typist to type with precision and high speed. During a recent briefing by the eReflect team, a spokesperson highlighted the various initiatives currently being introduced regarding keyboard layout and style. One such innovation is the launch of SnapKey’s Si Evolution Keyboard. The keyboard takes a contemporary approach; rather than providing a QWERTY style keyboard, it breaks down the alphabet into four groups. As the eReflect team explained, the keyboard “guesses” the words that the typist needs to type and users can switch between numbers and alphabets through a small key displayed on the left corner. For eReflect, such innovations within the keyboard are a step forward on the path to discovering new alternatives that can allow a typist to type faster. However, the success of such keyboards is often dependent on the ability of the user to adapt to the new style and layout after years of using a QWERTY style keyboard. In addition, the availability of a new keyboard is highly dependent on market forces. The eReflect team stressed that despite the innovations in keyboard design, the conventional QWERTY style will continue to remain popular with computer users as well as computer manufacturers. The team suggests that rather than focusing on innovative design, researchers should concentrate on ways to use the existing layout and still find ways to improve the keyboard so that typing speed is enhanced. The team concluded that their own latest innovation, Ultimate Typing, uses the QWERTY layout as part of a typing tutor software which can allow individuals to learn to type within two weeks. The team believes that the QWERTY layout is here to stay and therefore typists must learn to type in this configuration with speed and accuracy. The drills and exercises offered by Ultimate Typing can prove to be the ideal method for keyboard training which can allow even a beginning typist to become a typing expert. For more details on Ultimate Typing™ please visit http://www.ultimatetyping.com/. 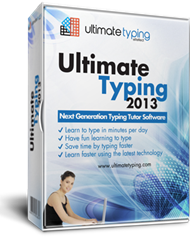 Ultimate Typing™ software is designed specifically for the improvement of typing skills. Created by eReflect, a world leader in e-learning and self-development software, Ultimate Typing™ has been informed by the latest developments in the science of touch typing. Since its creation in 2006 by Marc Slater, the company has already catered to over 112 countries all over the world, offering products with the latest cutting-edge technology, some of which are among the world’s most recognized and awarded in the industry.